Among the many wonders of Indian cuisine that appeal to the west, lentils and pulses lead the pack. From being the primary source of proteins for the vegetarians to providing much needed nitrogen for the soil, pulses have been around in our life forever. A little bit of theoretical study about these grains and their origins brought up a lot of Interesting trivia that I felt I should share. Matki - the Moth of Punjab and the Matki of Maharashtra, Sanskrit name Makushtha is now believed not to be Indian with proven origins in Guatemala and Mexico; leaving the origin of the Indian matki open....Lobia or the cowpea occurs as Nihpava in Buddhist canonical literature around 400BC, derived from lobos (Greek, Projection). It's again NOT of Indian origin, the current strain is believed to have come to us from Malaysia, where it was grown as fodder. Thuvar - whether it's the tall and bigger pod variety the North knows as Arahar or the South Indian shrubby Thuvarai; Pigeon pea till recently was believed to be African In origin, but of late South Indian excavations (around the western ghats ) have proved otherwise, giving hope that this grain that the Charaka Samhita so vividly endorses is Indian in origin!! Rajmah - the Shaane Kashmir legume is 8,000 years old but unfortunately has only spent the last 200 years in Kashmir having traveled from Peru via the Europeans; the French have been credited to try their cultivation first in India (like the broad bean which took the name French bean to credit their efforts). Well the origins might be local or global (or disputed ). The fact is, lentils are a 7,000 year old phenomena and every spoon of dal is a spoonful of history. 1. Roast the moong dal in a non-stick pan till all the raw smell disappears. Cool and soak in water overnight. The next day, drain and discard the water. 2. Grind the dal in a mixer to a thick paste using little water if required. Add carrots, green beans, salt, ginger, green chilli paste and mix well. Sprinkle the fruit salt on it and then a few drops of water on the fruit salt. When the bubbles form, mix gently. 3. Wet a muslin cloth and spread all over idli mould. 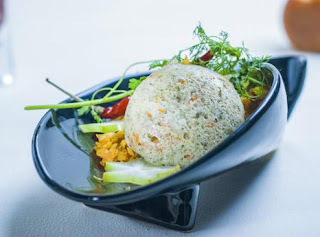 Pour the mixture gently into idli moulds and steam in a steamer for 15 minutes till they are done. 4. For masoor chutney, heat oil in a frying pan over medium heat. Add the fenugreek seeds, dried red chilies, mustard seeds and dal and stir fry about two minutes on a low flame. 5. Remove from the heat and allow it to cool, and then mix with green chilies, ginger, onion and tamarind extract in a bowl. 6. Transfer to a blender and process, adding little water if necessary to form a smooth paste. Add sugar and mix well. You can store it in the airtight container for up to two days in the refrigerator.